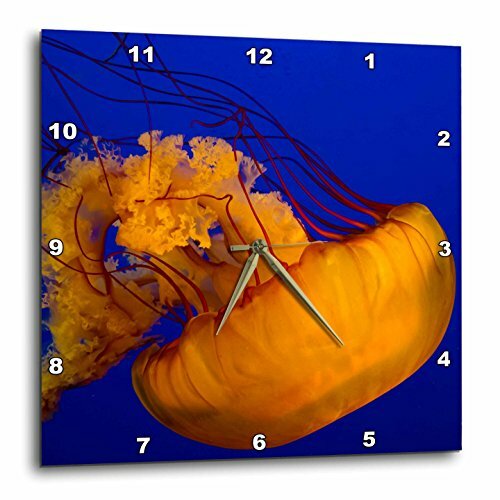 Pacific Sea Nettle Jellyfish, British Columbia Wall Clock is a wonderful complement to any room in your home or office. Made of durable high grade aluminum. This frameless clock has a high gloss mirror like, UV coated, scratch resistant finish and is suitable for a moist environment. Sizes available range from 10" x 10" to 15" x 15". Requires one AA battery; not included. Battery box is not covered. Made in USA. 3dRose DPP_161523_1 Blue & White Paw Print Pattern Pawprints Cute Cartoon Animal Eg Dog or Cat Footprints Wall Clock, 10 by 10"